Bring the outdoors in with the Emma Bridgewater A Year in the Country collection from Distinctive Decor. The nature-inspired collection features a variety of birds, flowers and other animals that are sure to brighten your day and lift your spirit. Enjoy a flock of birds in your kitchen every morning without the early morning chirping or sip coffee from a mug surrounded by playful squirrels. Create and grow your own animal sanctuary at home by adding new pieces every year. In addition to dinnerware, the designs are also available on tea towels, egg cups and gift sets. 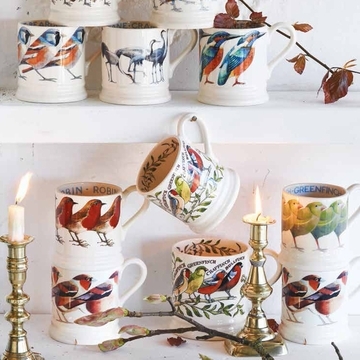 Emma Bridgewater's A Year in the Country items make great gifts for collectors, animal lovers and more. Mix and match your favorite pieces to create a custom set or try to collect them all. All Emma Bridgewater pottery is hand made in Stoke-on-Trent, England. The ceramic pieces are dishwasher and microwave safe for convenience. Pieces are carefully painted and glazed by master craftsmen to ensure accuracy of design and quality. All materials used are lead free and 100 percent food safe.